Malpighian Corpuscle: I ate bugs. I was starving. And trying desperately to avoid the candy jar. "I will be healthy!" I thought. "I brought raisins and by god, I will eat them!" Living with parents who've been raised by folks who made it through the depression has made me frugal. I do not waste food easily. Now, I have just moved back home this past weekend after being in Arizona for 5 months. I spent all of Sunday unpacking and haven't really gone food shopping yet. I mean, I picked up a box of frozen salmon but I can't really snack on that at work. So when the afternoon rapacious, greedy, insatiable hunger demon attacks, I need to be prepared. Yesterday's weapon of choice was an old, wayward box of stiff raisins that I clumsily grabbed as I was tearing out the door. I had no idea how old they were. But raisins last forever, right? Fast forward to 4pm. Normally I get hungry around 3 but I was particularly uninterested in my anti-starvation arsenal. I waited until my stomach started to digest itself and then, while composing a response to a guy wanting to sell us his useless vinyl record collection, I tore into the box of raisins. They were dry, crumbly and unyielding (a particularly unappetizing combination in a raisin) but I mindlessly jammed giant handfuls down my maw anyway. I downed nearly the entire box this way, not even looking. 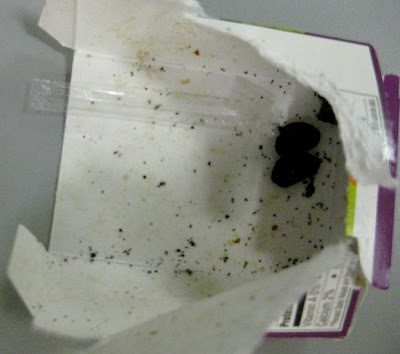 Now down to only three raisins glued to the back of the box, I clawed blindly but they were out of reach. So I tore it open. And made the mistake of looking. Um, raisins are not supposed to look like this, right? I looked closely, unable to help myself. Yep, bugs. Little segmented parts, tiny hairs and ingested raisin excreta all over the box. I don't know WHAT ate them, but I clearly did not get there first. I stood there a moment contemplating the philosophical cleansing of a good retching session. I have just discovered I have eaten bugs. The retching session might not end in time to workout. Call before you go anyway, might need someone to call for help. If they were in the popcorn they were good. No. It was the raisins. kak! oh that is bad. See, in popcorn they would probably be killed during the microwaving process. Not so in raisins. they'd probably be rather plump and juicy from all the good sugar. Like when I ate the cereal and I'd see all these tiny brown specs and think "I don't remember tiny brown things like that in Wheaties." So yes, you ate good, healthy, plump, bugs. Hopefully they washed their claspers and legs after defecating. Like, it's ok to have 29 thrips in your brussels sprouts but not 30. They draw the line at 30! Also, according to this piece from NPR, coffee is absolutely infested with roaches. If you want it free of roach dust, get beans that are ground on the spot. So, um, enjoy your meal! I'm going to be living off I-V bags from now on. Unless of course the bugs are breaded and fried, or dipped in chocolate.